Broncos quarterback Peyton Manning on the sidelines with offensive coordinator Adam Gase late in the fourth quarter against the Indianapolis Colts at Lucas Oil Stadium. ENGLEWOOD, Colo. (AP) — The architect of the most prolific offense in NFL history is postponing any interviews with other teams until Denver’s season is over. 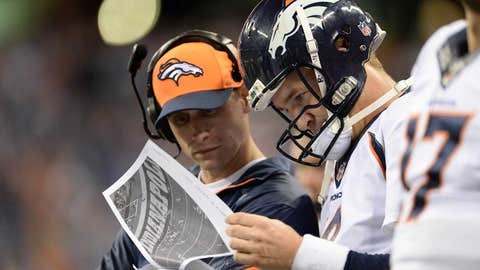 The Cleveland Browns had sought permission to speak with Broncos offensive coordinator Adam Gase about their vacant head coaching position after firing Rob Chudzinski. Gase, however, informed the Broncos’ front office he wanted to focus on finishing the job in Denver first, team spokesman Patrick Smyth said Monday. The Broncos (13-3) are the No. 1 seed in the AFC playoffs after Peyton Manning’s spectacular season in which he threw for 55 TDs and 5,477 yards, both NFL records, and Denver scored 606 points, more than any team in the league’s 93-year history. Gase would have been allowed to interview with other teams looking for a new head coach this weekend because the Broncos are on a bye. But coach John Fox said everyone in the organization is focused on reaching the Super Bowl. "I just know that to a man, everyone — player or coach, in that locker room or in those offices — is totally focused on our next opponent and what we have to do to win that game," Fox said. "Whether it was USC (and its interest in defensive coordinator Jack Del Rio) earlier in the year or Black Monday candidates, it’s all speculation. I can just assure you that all of our focus is on the Denver Broncos." In the locker room earlier Monday, wide receiver Bubba Caldwell said he thought Gase wouldn’t interview for the Browns’ vacancy or with any other team that might come calling until the Broncos’ playoff run is over. "I definitely get that sense that he’s got some unfinished business here that we’ve got to take care of and he doesn’t want to be a distraction in any way, so he’s going to finish the goal at hand," Caldwell said. Gase began his coaching career in 2000 at Louisiana State under Nick Saban. He broke into the NFL in 2003 as a scouting assistant in Detroit and was promoted to quarterbacks coach for the Lions in 2007. 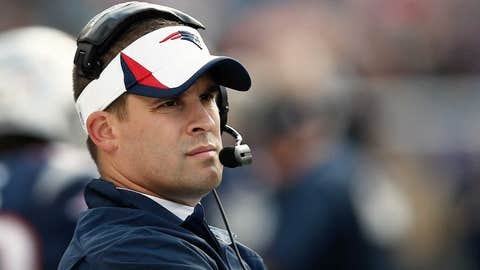 After serving a season as an offensive assistant with the 49ers, he came to Denver in 2009 and coached wide receivers for two years. He was Tim Tebow’s position coach in 2011 and Manning’s position coach in 2012 before being promoted to offensive coordinator after Mike McCoy took the head coaching job in San Diego last January. Gase promised a more up-tempo offense and delivered as the Broncos averaged 37.9 points, the most in the Super Bowl era, and became the first team to top 600 in a season. It appeared as though Del Rio had burnished his head coaching credentials after leading Denver to a 3-1 record as interim head coach during Fox’s absence following open-heart surgery in November, but Gase drew first attention. "That’s an honor because that shows he’s doing a great job here, he’s got a great offense rolling, the No. 1 offense ever," Caldwell said. "We don’t know if this is his time or not or what might happen, but he’s doing a great job with us, so I think the league is recognizing that."